Jon and Dany survive a face-off with the Night King, but sustain huge losses. Full recap of “Beyond the Wall”, plus preview of the Game of Thrones Season 7 Finale, “The Dragon and the Wolf”. 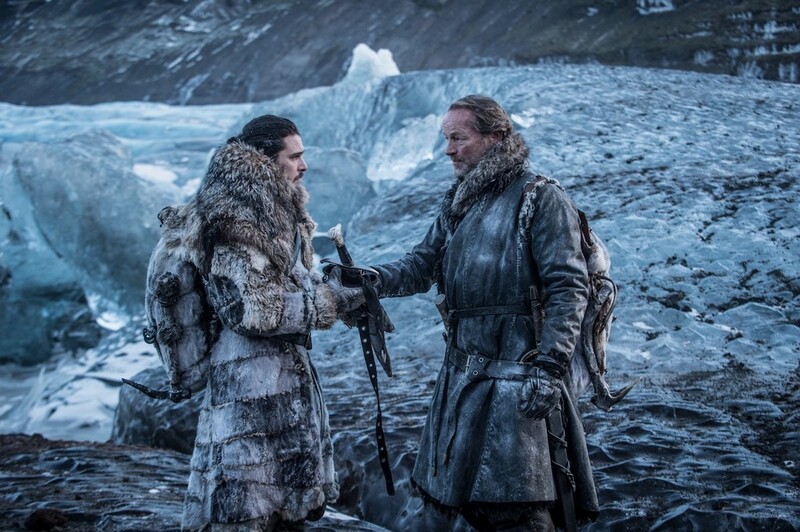 “Beyond the Wall” proceeds from where “Eastwatch” ends, with Jon, Tormund, Jorah, Dondarrion, Gendry, Sandor, and Thoros making the treacherous journey to capture a wight to bring South. Why in the world did we ever think this would be a good idea?! As they travel, there are several moments for the characters to get to know one another better and reconcile past disagreements. Jon tells Tormund about meeting Dany and how she will only help them fight is he bends the knee. 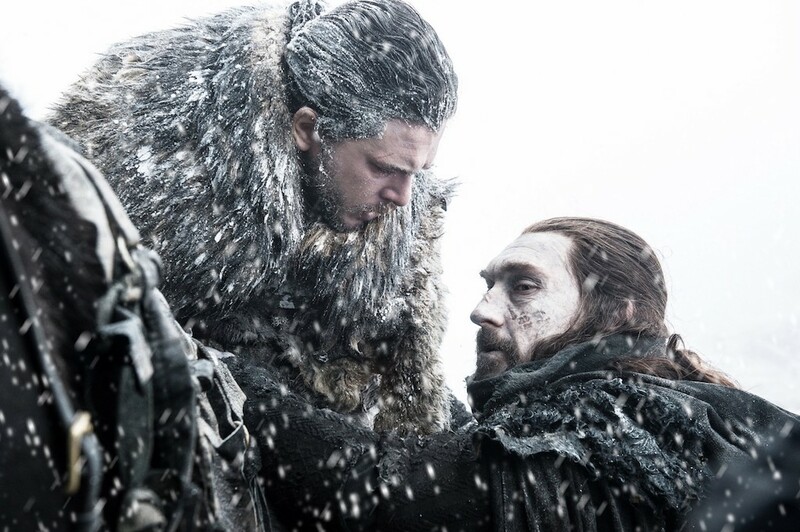 However, Tormund gives some pretty wise counsel about how it would be better for Jon to put his pride aside if it would save his people’s lives (unlike Mance Rayder). Gendry also expresses his frustration about Dondarrion and Thoros selling him to Mellisandre. After all, he wanted to join the Brotherhood Without Banners. Gendry talks about how Melisandre molests him and uses him for blood magic… pretty scary stuff. Then, in his own special way, Sandor Clegane interrupts. If Berric can survive being killed six times, then Gendry can stop his whinging! Tormund and the Hound have a very interesting conversation that begins with Sandor Clegane’s disdain for gingers (but red-heads are kissed by fire, like Sandor) and transitions to Tormund declaring his love for Brienne. “I want to make babies with her. Think of them–great, big monsters. They’d conquer the world.” *giggles* And our Briemund Oafkeeper ship sails! Jon and Berric also talk about their experiences being brought back to life by the Lord of Light. Jon doesn’t understand the point of serving a god that no one knows what he wants. But, for Berric, the thing that matters is that they’re soldiers fighting on the side of life. As they approach the mountain the Hound saw in the fire (Episode 1) the weather gets a lot worse. They see something nearby…a big bear with BLUE eyes. It looks like White Walkers can turn animals into the undead. YIKES. Jon and co. are attacked by the ice bear, who takes out a couple of their companions. Berric and Thoros are able to fight it with their flaming swords. Thoros actually shoves Sandor out of the way to prevent him from being attacked and is savagely bitten. The team is able to pull Thoros away, while the ice bear burns. He refuses to go back to Eastwatch for help, but Berric cautorizes his wound. Thoros is alive, for now. They continue and finally come across a small group of wights and a White Walker. Jon and the team get in place and then ambush. The fight is intesnse, but interestingly, when Jon kills the White Walker (with Longclaw) the remaining wights die! This is a new development… it looks like once a White Walker is killed, the wights it created also die with him. In this instance, one wight survives, and the team is able to subdue it. This is the one they will take back with them. 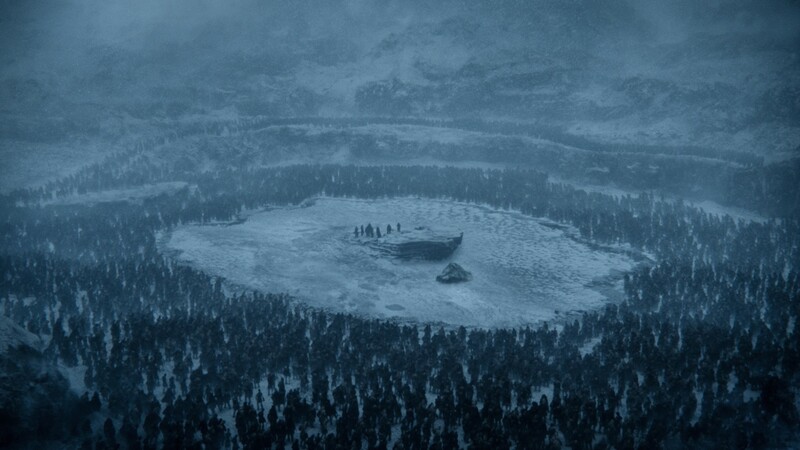 However, as they’re tying up the wight, Jon sees the massive Army of the Dead approaching. He orders Gendry to run back to Eastwatch and send a raven to Daenerys to ask for her help. Jon and those who remain run, but are trapped on a rock in the middle of a semi-frozen lake, surrounded on ALL sides. The Night King, White Walkers, and wights all wait for the lake to re-freeze. Gendry does eventually make it to Eastwatch where Davos meets him. Before Gendry passes out, he tells them to send a raven to Dany asking for help. *SIDENOTE* Can we talk about how awesome Gendry is? Because if it was up to me, I would have gotten lost, twisted my ankle while running, keeled over and died from exhaustion. So yah, Gendry, you’re the real MVP! 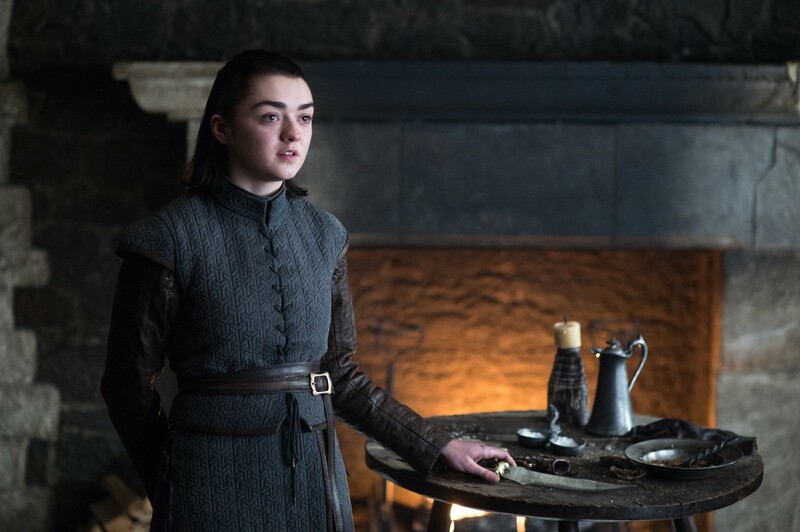 In Winterfell, Arya shares a memory of their father with Sansa. Arya, believing she was alone, practiced shooting arrows, which was against the rules. Yet, when she finally hit the bullesye, she heard a round of applause. Ned had been watching Arya the whole time and that reassurance from her father encouraged Arya. And now their father was dead, killed by the Lannisters… with Sansa’s help? Arya shows Sansa the note (asking Robb to come to King’s Landing and swear fealty to Joffrey). Arya makes serious accustions of betrayal aganst her sister. She remembers that Sansa stands aside as Ned is killed, all for her “beloved” Joffrey. Sansa argues that she was just a child being manipulated by Cersei. But Arya doesn’t by it, she would have died before betraying her family. 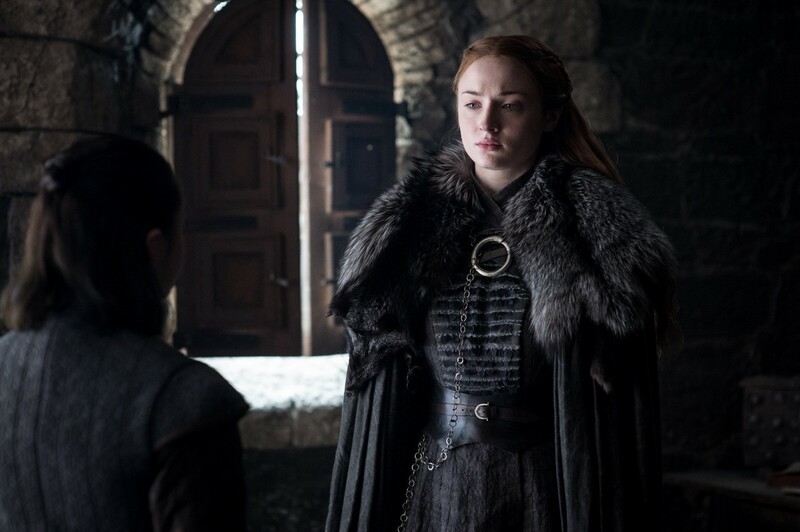 Sansa fights back, saying that while Arya was abroad “training,” she suffered unspeakable things and they’re all back in Winterfell because the Knights of the Vale rode North for her. When Sansa asks what Arya plans to do with the letter, Arya doesn’t respond right away. Why is Sansa so concerned? She wouldn’t be worried about Jon… but she would worry that the Northern Lords (especially Lyanna Mormont) wouldn’t like that Sansa betrayed her family. Sansa goes to Littlefinger to ask for his help. How did Arya get the letter? If the Northern Lords (who are already talking about turning their backs on Jon) find out that Sansa betrayed House Stark, they would never remain loyal to her or Jon. Littlefinger advises Sansa to rely on Brienne. Since Brienne is sworn to protect both of Catelyn Stark’s daughters, if she knows that one of he daughters (Arya) wishes to harm the other (Sansa), Brienne would be honor-bound to intercede. At first, Brienne is hesitant. Who will protect Sansa from Littlefinger when she’s gone? However, Sansa is confident that she will be safe in Winterfell, her home. Sansa does some snooping of her own, searching through Arya’s room, maybe looking for the letter…? Instead Sansa comes across Arya’s faces. Arya catches Sansa, but tells the truth about training to the a Faceless Man in Braavos and the Game of Faces. It really creeps Sansa (and us) out! Arya then talks about how when they were younger, they both wanted to be other people. Sansa wanted to be a queen and Arya wanted to be a knight. Being girls limits those possibilities, but with the faces, Arya can now choose who she wants to be. She could even become Sansa… but Arya doesn’t take Sansa’s face. She walks out of the room, leaving Sansa even more frantic than before. Why the hell is Littlefinger still alive?! Why does Sansa go to him for advice? Why are the Stark Sisters fighting? UGH. It’s interesting because there are two possibilities here. Our friend Lizzie over at Fangirlish is so incesed by what she perceives as the writers completely botching what should be a solid female relationship. She has a sensational editorial talking about why Sansa and Arya deserve better, especially given years of character growth. You can read HERE. On the other hand, TIME has a piece suggesting that Sansa and Arya are actually in cahoots with one another to kill Littlefinger. Isn’t the Sansa/Arya reunion a genuine one? Why would Sansa send Brienne away, against Petyr Baelish’s advice that Brienne can protect Sansa from Arya? Back at Dragonstone, Dany has a fit of pique. Why is it that the men who love her are so hellbent on sacrificing their lives to be heroes? Drogo, Jorah, Daario… Jon Snow 😉 . Tyrion enjoys pointing out Jon’s longing looks of interest, despite Jon being too “little” for Dany. Conversation moves on to Dany speculating about meeting Cersei. Dany seems to think they might be better off laying a trap for Cersei (because OF COURSE Cersei is doing the same), but again, Tyrion cautions against trying to win this war with deceit and murder. Dany becomes frustrated because, yet again, it seems that Tyrion is trying to hamstring her. Tyrion reassures Dany that he believes in her and the world she wants to build, but it’s doubtful this can happen all in one lifetime. Quite unexpectedly, this transitions into a discussion of succession. Dany is determined to fight, but if she dies, who pickes up the mantle after her? Dany can’t have children, but there are other ways of picking a successor. But Dany shuts down the conversation. For her, succession is something to consider after she wins the Iron Throne. Meanwhile, beyond the Wall, several days must pass. Thoros dies from his wounds and they all have a drink, say prayers to the Lord of Light, and then burn the body. They also speculate how they might have a chance if they replicate what Jon did earlier, kill the walkers and the wights it turned will also fall. However, Berric makes a big observation: the Night King is the one who turned them all. Perhaps this is the exact reason Jon and Dondarrion are in this place, at this time. Later, Sandor Clegane is bored and starts throwing rocks at the wights. One of those rocks falls short and hits the lake… which is now frozen… and the Hound has alerted everyone to that fact. UGH. The wights descend on all sides and the battle begins. Jon and co. hold their own and save one another several times. After some time, Jon calls for the team to fall back, but there is literally no where to go. They’re completely surrounded, and yet they fight hard and incessantly. The scene hones in on Jon, prepared to fight to his death. And when hope seems lost, Dany and her dragons arrive! It is glorious. They breathe fire, completely decimating hundreds and hundreds of wights at a time. When Dany and Drogon land so Jon and his team can climb on, Jon sees wights coming to attack and stays behind to fight them off and protect Dany/Drogon. As all this is going on, Viserion and Rhaegal are still in the air lighting wights on fire. But then the Night King takes one of his spears and launches it in the air, striking Viserion in his side. Viserion goes down hard, bleeding, dead, and sinks to the bottom of the frozen lake NOOOOOOO! Everyone is in shock and Jon, especially, is enraged. 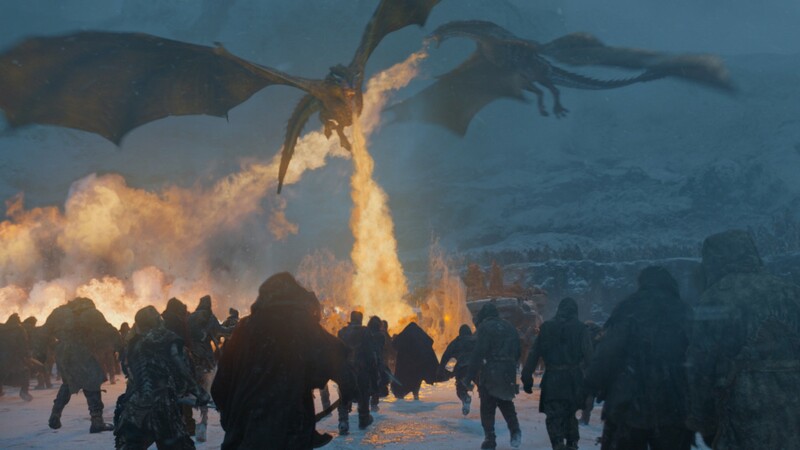 He continues to fight off the wights and when he realizes that the Night King will try to kill the other two dragons, he screams for Dany, Drogon, Rhaegal, and team to leave. Unfortunately, as Jon is running back to Drogon, a group of wights knock him into the water, so Dany and co. must leave without Jon. When Jon wakes up, the first person he sees is Dany, sitting at his side. And the first thing he says is an apology for Viserion dying. Jon takes her hand, in sympathy. Dany mourns, but she is glad to have seen the Army of the Dead. Now she knows, and she promises that she will help Jon destroy the Night King. Jon thanks her, calling her Dany, and I think this might be the first time since Season 1 that we’ve actually heard anyone on the show actually use that nickname *SWOONS* But then Jon swears his loyalty to her, and figuratively bends the knee to his Queen. 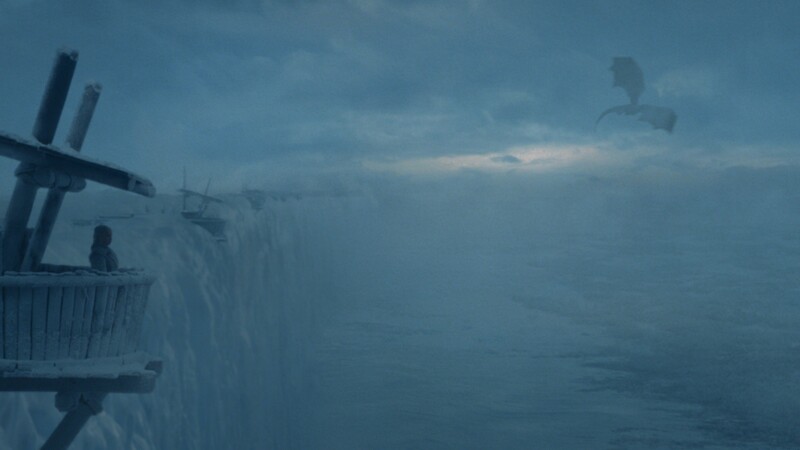 In the episode’s last minutes, we return beyond the Wall where the wights are using chains to pull Viserion’s carcass out of the ice water. 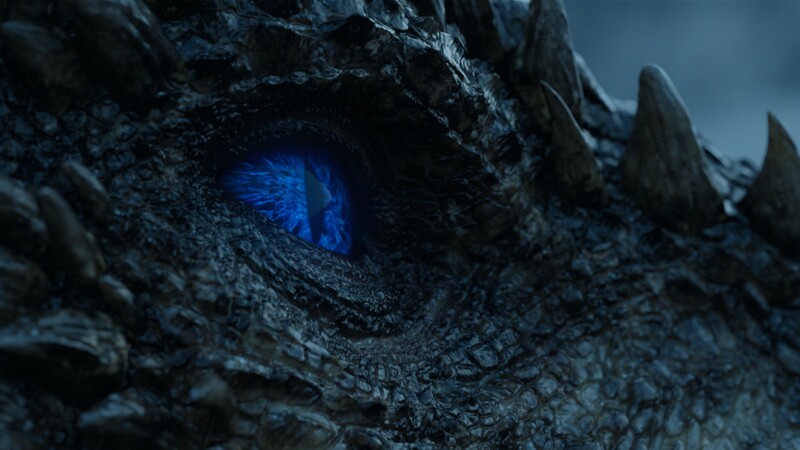 The Night King approaches, lays his hand on it, and Viserion opens his eye, a BLUE EYE. Because ICE DRAGON. And there are so many questions! 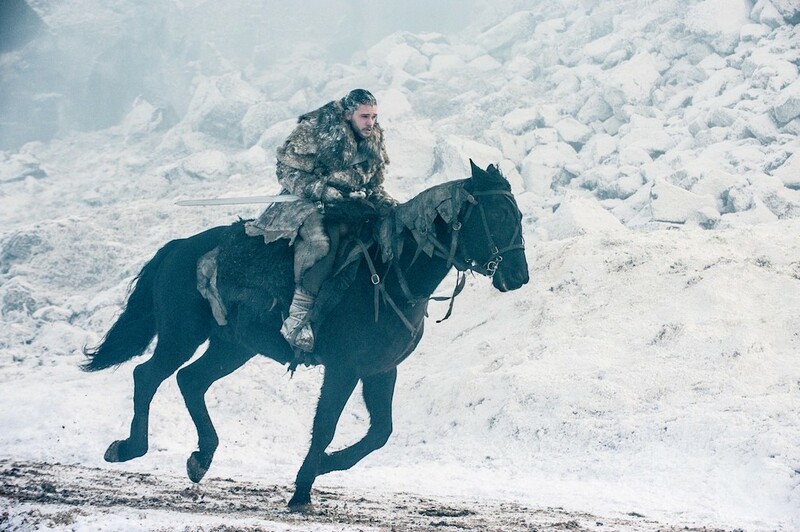 Who rides an ice dragon? Does an ice dragon breathe ice or fire? Could Viserion still, possibly be loyal to Dany as his mother? Or maybe, because Jon has died too, could he be able to control Ice Viserion? And of course the question remains, who is the Dragon and Wolf the title refers to? It could be Dany and Jon… but it could also be Rhaegar and Lyanna! If we get a Rhaegar/Lyanna flashback, I’m going to freak all the way out! “The Dragon and the Wolf” airs August 27 at 9p/8c on HBO, so make sure to tune in and come live tweet with us!